- AJPW Budokan Hall (June 12, '86) = Sasaki was beaten by Mitsuo Momota. - AJPW Budokan Hall (December 12, '86) = Sasaki lost to Yoshinari Ogawa. - AJPW Budokan Hall (March 12, '87) = Sasaki fought to a Draw with Shinji Sasazaki. - NJPW Sumo Hall (August 10, '87) = Sasaki pinned Chris Benoit. - NJPW Sumo Hall (August 19, '87) = Sasaki & Osamu Matsuda fell to Yoji Anjoh & Tatsu Nakano. - NJPW Sumo Hall (August 20, '87) = Sasaki, Osamu Matsuda, & Kenichi Oya defeated Yoji Anjoh, Shigeo Miyato, & Tatsuo Nakano. - NJPW Sumo Hall (October 25, '87) = Sasaki fought to a 15-Minute Draw with Akira Nogami. - NJPW Sumo Hall (December 4, '87) = Sasaki beat Osamu Matsuda. - NJPW Inoki Toukan Live III (December 27, '87) = Sasaki forced Osamu Matsuda to submit. - NJPW Sumo Hall (June 26, '90) = Sasaki, Riki Choshu, Kantaro Hoshino, Kuniaki Kobayashi, & Shiro Koshinaka won a "Three Falls" Match over Super Strong Machine, Tatsutoshi Goto, Animal Hamaguchi, Masanobu Kurisu, & Hiro Saito. - NJPW Sumo Hall (August 19, '90) = Sasaki & Hiroshi Hase defeated Osamu Kido & Kengo Kimura. - NJPW New Japan in China (September 1, '90) = Sasaki beat Michiyoshi Ohara. - NJPW Budokan Hall (November 1, '90) = Sasaki & Hiroshi Hase took down Masa Chono & Keiji Mutoh. - NJPW New Japan in Iraq (December 3, '90) = Sasaki & Hiroshi Hase fell to Riki Choshu & Masa Saito. - NJPW Sumo Hall (December 13, '90) = Sasaki & Hiroshi Hase retained the IWGP World Tag-Team Titles, beating Takayuki Iizuka & Shiro Koshinaka. - NJPW Legends Show (December 26, '90) = Sasaki & Hiroshi Hase lost the IWGP Tag-Team Titles to Hiro Saito & Super Strong Machine. - NJPW Starrcade in Tokyo Dome (March 21, '91) = Sasaki & Hiroshi Hase lost the NJPW IWGP Tag-Team Titles to the Steiner Brothers. - NJPW Sumo Hall (April 30, '91) = Sasaki & Hiroshi Hase were beaten by Riki Choshu & Tatsutoshi Goto. - NJPW Sumo Hall (August 9, '91) = Sasaki & Hiroshi Hase defeated Brian Pillman & Black Cat. - NJPW Sumo Hall (August 10, '91) = Sasaki & Hiroshi Hase won over Osamu Kido & Kengo Kimura. - NJPW Sumo Hall (August 11, '91) = Sasaki, Hiroshi Hase, & Tatsumi Fujinami fell to Bam Bam Bigelow, Scott Norton, & Big Van Vader. - NJPW Budokan Hall (June 12, '91) = Sasaki was forced to submit to Riki Choshu. - NJPW Budokan Hall (June 26, '92) = Sasaki fell to Hiroshi Hase. - NJPW G-1 Climax '92 (August) = Sasaki defeated Jim Neidhart and Terry Taylor, then lost to Rick Rude. Masa Chono won the tournament. - NJPW Sumo Hall (August 12, '92) = Sasaki & Keiji Mutoh were beaten by the Steiner Brothers. - NJPW Super Grade Tag League II (October '92) = Sasaki & Hiro Hase lost in the finals to Riki Choshu & Shinya Hashimoto. - NJPW Sumo Hall (November 23, '92) = The Hellraisers (Power Warrior & Hawk Warrior) defeated Riki Choshu & Hiroshi Hase. - WCW Starrcade '92 (December 28) = Sasaki & the Barbarian were beaten by Dustin Rhodes & Big Van Vader. - NJPW Fantastic Story (January 4, '93) = The Hellraisers fought to a Double Countout with the Steiner Brothers. - NJPW Sumo Hall (February 16, '93) = The Hellraisers retained the IWGP World Tag-Team Titles, beating Tony Halme & Rambo. - NJPW Sumo Hall (April 6, '93) = The Hellraisers took down Masa Chono & Takayuki Iizuka. - NJPW Wrestling Dontaku '93 (May 3) = The Hellraisers kept the IWGP Tag-Team Titles, beating Masa Chono & Shinya Hashimoto. - NJPW Budokan Hall (June 15, '93) = The Hellraisers defeated John Tenta & Haku. - NJPW Sumo Hall (August 2, '93) = The Hellraisers stayed the IWGP World Tag-Team Champions, beating the Faces of Fear. - NJPW Sumo Hall (August 3, '93) = The Hellraisers kept the IWGP Tag-Team Titles, winning over the Nasty Boys. - NJPW Sumo Hall (August 4, '93) = The Hellraisers retained the IWGP Tag-Team Straps, defeating Ashura Hara & Genichiro Tenryu. - NJPW Sumo Hall (August 5, '93) = The Hellraisers lost the IWGP World Tag-Team Titles to Hercules Hernandez & Scott Norton. - NJPW Sumo Hall (August 8, '93) = The Hellraisers lost, via DQ, to the IWGP World Tag-Team Champs, Hercules Hernandez & Scott Norton. - NJPW Super Grade Tag League III (October/November '93) = The Hellraisers competed in the league, which was won by Hiroshi Hase & Keiji Mutoh. - NJPW Battlefield (January 4, '94) = The Hellraisers won the IWGP World Tag-Team Titles, defeating Hercules Hernandez & Scott Norton. - NJPW Sumo Hall (February 17, '94) = Power Warrior & Jushin Thunder Liger lost to the Steiner Brothers. - NJPW Budokan Hall (February 24, '94) = Power Warrior, Akira Nogami, & Takayuki Iizuka fell to Riki Choshu, Tatsumi Fujinami, & Osamu Kido. - NJPW Wrestling Dontaku '94 (May 4) = The Hellraisers retained the IWGP Tag-Team Titles, beating the Steiner Brothers. - NJPW Budokan Hall (June 15, '94) = Power Warrior & Hiroshi Hase were beaten by the Steiner Brothers. - NJPW Sumo Hall (August 3, '94) = Power Warrior was pinned by Tatsumi Fujinami. - NJPW Sumo Hall (August 4, '94) = Power Warrior took down Hiroshi Hase. - NJPW Sumo Hall (August 5, '94) = Power Warrior fought to a Draw with Shinya Hashimoto. - NJPW Sumo Hall (August 6, '94) = Power Warrior defeated Shiro Koshinaka. - NJPW Sumo Hall (August 7, '94) = Power Warrior beat Takayuki Iizuka. Later on, Power Warrior lost in the finals of the '94 G-1 Climax to Masa Chono. - NJPW Super Grade Tag League IV (October '94) = The Hellraisers lost in the semi-finals to Masa Chono & Super Strong Machine. Hiroshi Hase & Keiji Mutoh won the league. - NJPW Sumo Hall (October 30, '94) = The Hellraisers fell to Masa Chono & Super Strong Machine. - NJPW Battle Seven (January 4, '95) = Kensuke Sasaki lost to the IWGP Heavyweight Champion, Shinya Hashimoto. - Pyongyang Sports Festival (April 28, '95) = Sasaki pinned Masa Saito. - Pyongyang Sports Festival (April 29, '95) = Sasaki & Hiroshi Hase were beaten by the Steiner Brothers. - NJPW Sumo Hall (February 19, '95) = Sasaki, Hiroshi Hase, & Riki Choshu lost to Masa Chono, Hiro Saito, & Hiroyoshi Tenzan. - WCW/NJPW Kollision in Korea (April '95) = Sasaki & Hiroshi Hase were beaten by the Steiner Brothers. - NJPW Wrestling Dontaku '95 (May 3) = Sasaki took down Hiroyoshi Tenzan. - NJPW Budokan Hall (June 14, '95) = Sasaki & Riki Choshu won over Masa Chono & Hiro Saito. - NJPW Sumo Hall (August 11, '95) = Sasaki fell to Hiroyoshi Tenzan. - NJPW Sumo Hall (August 12, '95) = Sasaki pinned Shinya Hashimoto. - NJPW Sumo Hall (August 13, '95) = Sasaki was beaten by Scott Norton. - NJPW Sumo Hall (August 14, '95) = Sasaki & Akira Nogami lost to Tatsutoshi Goto & Shiro Koshinaka. - NJPW Sumo Hall (August 15, '95) = Sasaki & Tadao Yasuda were taken down by Scott Norton & Masa Saito. - NJPW G-1 Climax '95 (August) = Sasaki competed in the league, which was won by Keiji Mutoh. - NJPW Tokyo Dome (October 9, '95) = Sasaki(NJPW) was forced to submit to Masahito Kakihara(UWFI). - NJPW Super Grade Tag League V (October '95) = Sasaki & Masa Saito (replacing Riki Choshu) competed in the league, which was won by Masahiro Chono & Hiroyoshi Tenzan. - NJPW Sumo Hall (November 13, '95) = Sasaki won the WCW United States Heavyweight Title, pinning Sting. - WCW World War III '95 (November 26) = Sasaki retained the WCW United States Heavyweight Title, defeating Chris Benoit. Later on, Sasaki competed in the "World War III 3-Ring Battle Royal", which was won by Randy Savage. - WCW Starrcade '95 (December 27) = Sasaki(NJPW) fell to Sting(WCW). Later on, Sasaki had a controversial match with the One Man Gang. On TV, the Gang pinned Sasaki for the WCW US Title. However, the match was then restarted, with Sasaki beating the Gang to retain the WCW US Title. - NJPW Wrestling War in Tokyo Dome '96 (January 4) = Sasaki beat Hiro Hase. - NJPW Sumo Hall (April 25, '96) = Sasaki & Riki Choshu defeated Satoshi Kojima & Osamu Nishimura. 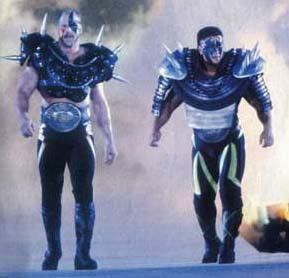 - NJPW Battle Formation '96 (April 29) = Power Warrior & the Road Warriors won over Scott Norton & the Steiner Brothers. 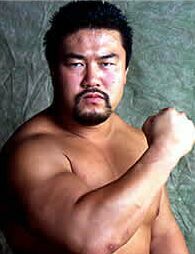 - NJPW Rikidozan Memorial Show (June 30, '96) = Sasaki & Keiji Mutoh took down Shinya Hashimoto & Junji Hirata. - NJPW Sumo Hall (August 2, '96) = Sasaki forced Hiroyoshi Tenzan to submit. - NJPW Sumo Hall (August 3, '96) = Sasaki took down Junji Hirata. - NJPW Sumo Hall (August 5, '96) = Sasaki fell to Riki Choshu, who went on to win the '96 G-1 Climax. - NJPW Sumo Hall (August 6, '96) = Sasaki pinned Shinya Hashimoto. - UWFI Jingu Stadium (September 11, '96) = Sasaki beat Masahito Kakihara. - NJPW Super Grade Tag League VI (October/November '96) = Sasaki & Riki Choshu competed in the league, which was won by Shinya Hashimoto & Scott Norton. - NJPW Wrestling World in Tokyo Dome '97 (January 4) = Power Warrior pinned the Great Muta. - NJPW Sumo Hall (February 16, '97) = Sasaki, Riki Choshu, & Tadao Yasuda were beaten by Buff Bagwell, Masa Chono, & Scott Norton. - NJPW Battle Formation '97 (April 12) = Sasaki & Riki Choshu won the IWGP World Tag-Team Titles, taking down Kengo Kimura & Tatsumi Fujinami. - NJPW Strong Style Evolution (May 3, '97) = Sasaki & Riki Choshu lost the NJPW IWGP World Tag-Team Titles to Satoshi Kojima & Manabu Nakanishi. - NJPW Budokan Hall (June 5, '97) = Sasaki, Tatsumi Fujinami, & Kazuo Yamazaki beat Shiro Koshinaka, Akira Nogami, & Michiyoshi Ohara. - NJPW Sumo Hall (August 2, '97) = Sasaki defeated Buff Bagwell. - NJPW Sumo Hall (August 3, '97) = Sasaki won over Scott Norton and Hiroyoshi Tenzan to win the 1997 G-1 Climax. - NJPW The Four Heaven (August 10, '97) = Sasaki & Kazuo Yamazaki won the NJPW IWGP Tag-Team Titles, beating Satoshi Kojima & Manabu Nakanishi. - NJPW Three Gun Tag Team Tournament (September '97) = Sasaki & Kazuo Yamazaki took down Masa Chono & nWo Sting, Shinya Hashimoto & Tadao Yasuda, and Hiroyoshi Tenzan & the Great Muta to win the tournament. - NJPW Budokan Hall (September 23, '97) = Sasaki & Kazuo Yamazaki were beaten by Masa Chono & the Great Muta. - NJPW Final Battle Hall (November 2, '97) = Sasaki pinned Riki Choshu. - NJPW Super Grade Tag League VII (November/December '97) = Sasaki & Kazuo Yamazaki lost in the semi-finals to Shinya Hashimoto & Manabu Nakanishi. Masa Chono & Keiji Mutoh won the league. - NJPW Power Hall in Tokyo Dome (January 4, '98) = Sasaki kept the IWGP Heavyweight Title, pinning Keiji Mutoh. - NJPW Budokan Hall (February 15, '98) = Sasaki fell to Scott Norton. - NJPW The Inoki Final (April 4, '98) = Sasaki lost the IWGP Title to Tatsumi Fujinami. - NJPW IWGP Tag-Team Title Tournament (June '98) = Sasaki & Kazuo Yamazaki beat Big Titan & Michael Wallstreet, then fell to the eventual winners, Masa Chono & Hiroyoshi Tenzan. - NJPW Sumo Hall (July 31, '98) = Sasaki pinned Michiyoshi Ohara. - NJPW Sumo Hall (August 1, '98) = Sasaki was forced to submit to Kazuo Yamazaki. Shinya Hashimoto went on to win the '98 G-1 Climax. - NJPW Rising the Next Generation (August 8, '98) = Sasaki won, via DQ, over Don Frye. - NJPW Sumo Hall (August 13, '98) = Sasaki fell to Keiji Mutoh. - NJPW Sumo Hall (August 14, '98) = Sasaki lost to Yuji Nagata. - NJPW WCW Tag Title Contenders League (September '98) = Sasaki & Yuji Nagata beat Scott Norton & Michael Wallstreet and Shinya Hashimoto & Kazuo Yamazaki to win the league. - NJPW Super Grade Tag League VIII (November/December '98) = Sasaki & Kazuo Yamazaki competed in the league, which was won by Satoshi Kojima & Keiji Mutoh. - NJPW Wrestling World '99 (January 4) = Sasaki won, via DQ, over Atsushi Onita. - NJPW St. Valentine's Day Massacre (February 14, '99) = Sasaki lost to the NJPW IWGP Heavyweight Champion, Keiji Mutoh. - NJPW Strong Style Symphony (April 10, '99) = Sasaki & Shiro Koshinaka retained the IWGP Tag-Team Titles, beating Tatsumi Fujinami & Genichiro Tenryu. - NJPW Budokan Hall (June 8, '99) = Sasaki forced Meng to submit. - NJPW G-1 Climax '99 (August) = Sasaki competed in the league, which was won by Manabu Nakanishi. - NJPW Sumo Hall (August 15, '99) = In a dark match, Sasaki took down Tatsumi Fujinami. - NJPW G-1 Climax Tag-Team League '99 (September) = Sasaki & Kazuyuki Fujita competed in the league, which was won by Keiji Mutoh & Scott Norton. - NJPW Budokan Hall (September 23, '99) = Sasaki & Brian Johnston were beaten by Don Frye & Genichiro Tenryu. - NJPW Final Dome '99 (October 11) = Sasaki fell to Genichiro Tenryu. - NJPW Wrestling World '00 (January 4) = Sasaki won the IWGP World Heavyweight Title, defeating Genichiro Tenryu. - NJPW Sumo Hall (February 20, '00) = Sasaki forced Masa Chono to submit. Later on, Sasaki, in turn, was forced to submit to Chono. - NJPW Dome Impact '00 (April 7) = Sasaki took down Jushin Thunder Liger. - NJPW Wrestling Dontaku '00 (May 5) = Power Warrior stayed the IWGP World Heavyweight Champion, beating the Great Muta. - NJPW Budokan Hall (June 2, '00) = Sasaki retained the IWGP World Heavyweight Title, winning over Manabu Nakanishi. - NJPW Yokohama Arena PPV (July 30, '00) = Sasaki & Yuji Nagata beat Manabu Nakanishi & Yutaka Yoshie. - NJPW Sumo Hall (August 11, '00) = Sasaki defeated Satoshi Kojima. - NJPW Sumo Hall (August 12, '00) = Sasaki beat Osamu Kido. - NJPW Sumo Hall (August 13, '00) = Sasaki won over Yuji Nagata and Manabu Nakanishi to win the 2000 G-1 Climax. - NJPW Do Judge (October 9, '00) = Sasaki lost to Toshiaki Kawada. - NJPW G-1 Climax Tag-Team League '00 (November) = Sasaki & Shiro Koshinaka competed in the league, which was won by Takashi Iizuka & Yuji Nagata. - NJPW Furitsu Gym PPV (December 14, '00) = Sasaki & Super Strong Machine defeated Masahiro Chono & Team 2000 Machine. - NJPW Wrestling World '01 (January 4) = Sasaki beat Satoshi Kojima, Masa Chono, and Toshiaki Kawada to win the vacated IWGP World Heavyweight Title. - AJPW King's Road New Century '01 (January 28) = Sasaki & Toshiaki Kawada took down Hiroshi Hase & Genichiro Tenryu. - NJPW Sumo Hall (February 18, '01) = Sasaki retained the IWGP Heavyweight Title, beating Shinjiro Ohtani. - NJPW Strong Style '01 (April 9) = Sasaki lost a "No Rules" match to Shinya Hashimoto. - NJPW Indicate of Next (October 8, '01) = Sasaki lost a "Vale Tudo" Match to Kazuyuki Fujita. - NJPW G-1 Climax Tag-Team League '01 (November/December) = Sasaki & Danny Devine competed in the league, which was won by Satoshi Kojima & Hiroyoshi Tenzan. - NJPW Wrestling World '02 (January 4) = Sasaki fought to a No-Contest with Naoya Ogawa. - NJPW Sumo Hall (February 16, '02) = Sasaki was pinned by Manabu Nakanishi. - NJPW IWGP Tag-Team Title Tournament (March '02) = Sasaki & Shiro Koshinaka lost in the first round to the eventual winners, Masa Chono & Hiroyoshi Tenzan. - NJPW 30th Anniversary Show (May 2, '02) = Sasaki & Hiroshi Tanahashi fell to the Steiner Brothers. Joanie Lauer was the special referee. - NJPW Fighting Spirit Memorial Day (May 18, '02) = Sasaki pinned Akira. - NJPW Budokan Hall (June 7, '02) = Sasaki lost to the IWGP Heavyweight Champion, Yuji Nagata. - NJPW G-1 Climax '02 (August) = Sasaki competed in the league, which was won by Masa Chono. - NJPW Sumo Hall (August 10, '02) = Sasaki, Hiroshi Tanahashi, & Kenzo Suzuki won over Masahito Kakihara, Yutaka Yoshie, & Yuji Nagata. - NJPW Sumo Hall (August 11, '02) = Sasaki & Yuji Nagata took down Osamu Nishimura & Hiroyoshi Tenzan. - NJPW Budokan Hall (August 29, '02) = Sasaki KO'ed Minoru Fujita. - WJ Magma-01 (March 1, '03) = Sasaki & Hiroshi Hase defeated Don Frye & Daniel Bobish. - WJ Sumo Hall (July 20, '03) = Sasaki pinned Riki Choshu, Steve Williams, and Kenzo Suzuki to win the first WJ WMG Title. - NJPW Wrestling World '04 (January 4) = Sasaki lost to Yuji Nagata. - NJPW Sumo Hall (February 15, '04) = Sasaki fell to Hiroyoshi Tenzan. - NJPW Sumo Hall (March 28, '04) = Sasaki lost the IWGP Heavyweight Title to Bob Sapp. - AJPW Champion Carnival '04 (April) = Sasaki beat Satoshi Kojima, but lost in the finals to Keiji Mutoh. - NJPW Nexess (May 3, '04) = Sasaki & Manabu Nakanishi fell to Kendo Kashin & Yuji Nagata. - Toryumon 6th Anniversary Show (July 4, '04) = Sasaki & Akira Hokuto lost, via DQ, to Michael Iwasa & Daniel Mishima. - NJPW G-1 Climax '04 (August) = Sasaki competed in the league, which was won by Hiroyoshi Tenzan. - NJPW Sumo Hall (August 13, '04) = Sasaki pinned Manabu Nakanishi. - NJPW Sumo Hall (August 14, '04) = Sasaki lost to Hiroshi Tanahashi. - NJPW Sumo Hall (August 15, '04) = Sasaki fell to Genichiro Tenryu. - NJPW Sumo Hall (October 9, '04) = Sasaki won the IWGP Heavyweight Title, beating Kazuyuki Fujita. - AJPW Keiji Mutoh 20th Anniversary Show (October 30, '04) = Sasaki & Hiroshi Hase lost to Keiji Mutoh & Mitsuharu Misawa. - NJPW Chrono Stream: Masa Chono's 20th Anniversary (November 3, '04) = Sasaki stayed the IWGP Heavyweight Champion, defeating Hiroshi Tanahashi. - NJPW Toukon Festival (November 13, '04) = Sasaki retained the IWGP Heavyweight Title, pinning Minoru Suzuki. - AJPW Real World Tag League '04 (November/December) = Sasaki & Katsuhiko Nakajima competed in the league, which was won by Taiyo Kea & Jamal. - AJPW Giant Baba Farewell (February 5, '05) = Sasaki, Kaz Hayashi, & Keiji Mutoh were beaten by Hiroshi Hase, Satoshi Kojima, & Takao Omori. - AJPW Realize (February 16, '05) = Sasaki pinned Kohei Suwama. - NJPW Sumo Hall (February 20, '05) = Sasaki, Shinsuke Nakamura, Yuji Nagata, & Hiroshi Tanahashi lost an "Elimination" Match to Masahiro Chono, Mitsuya Nagai, Manabu Nakanishi, & Minoru Suzuki. - NJPW Nexess V (March 26, '05) = Sasaki & Takashi Iizuka were beaten by Minoru Suzuki & Ron Waterman. - AJPW Korakuen Hall (April 10, '05) = Sasaki lost to Giant Bernard. - AJPW Champion Carnival '05 (April) = Sasaki took down Toshiaki Kawada and Jamal to win the league. - Dragon Gate Pro Wrestling Festival '05 (July 3) = Sasaki & Katsuhiko Nakajima defeated Magnum Tokyo & Genichiro Tenryu. - NOAH Destiny '05 (July 18) = Sasaki lost to Kenta Kobashi. - AJPW Heavy Fighting Yoyogi (July 26, '05) = Sasaki & Katsuhiko Nakajima won the AJPW All Asian Tag-Team Titles from Brother Yasshi & Shuji Kondo. - Zero-One Fire Festival '05 (July/August) = Sasaki lost in the finals of the league to Shinjiro Ohtani. - Wrestle-1 Sumo Hall (August 4, '05) = Sasaki pinned Riki Choshu. - Wrestle-1 Yoyogi National Stadium Gym (October 2, '05) = Sasaki fell to the Great Muta. - NOAH Budokan Hall (November 5, '05) = Sasaki & Katsuhiko Nakajima defeated Kenta Kobashi & Go Shiosaki. - AJPW The Unchained World (November 19, '05) = Sasaki lost to the AJPW Triple Crown Champion, Satoshi Kojima. - AJPW Real World Tag League '05 (November/December) = Sasaki & Katsuhiko Nakajima competed in the league, which was won by Team 3-D.
- NOAH Budokan Hall (January 22, '06) = Sasaki, Mushiking Joker, & Katsuhiko Nakajima were beaten by Mushiking Terry, Takashi Sugiura, & Mitsuharu Misawa. - AJPW Champion Carnival '06 (April) = Sasaki competed in the league, which was won by Taiyo Kea. - NOAH Budokan Hall (July 16, '06) = Sasaki & Yoshihiro Takayama fell to Jun Akiyama & Mitsuharu Misawa. - AJPW Heavyweight Battle Royal '07 (January 2) = Sasaki won the Battle Royal. - AJPW Pro Wrestling Love in Ryogoku Vol. 2 (February 17, '07) = Sasaki & Raimu Mishima were beaten by Suwa & Taru. - AJPW Champion Carnival '07 (March) = Sasaki competed in the league, which was won by Keiji Mutoh. - AJPW Pro Wrestling Love in Ryogoku Vol. 3 (August 26, '07) = Sasaki won the AJPW Triple Crown Title, pinning Minoru Suzuki. - AJPW Pro Wrestling Love in Ryogoku Vol. 4 (March 1, '08) = Sasaki retained the AJPW Triple Crown Title, beating Satoshi Kojima. - NOAH GHC Tag-Team Titles League (March/April '08) = Sasaki & Katsuhiko Nakajima competed in the league, which was won by Akitoshi Saito & Bison Smith. - NJPW Champion Carnival '08 (April) = Sasaki competed in the league, which was won by Suwama. - NOAH Budokan Hall (April 27, '08) = Sasaki & Katsuhiko Nakajima defeated Jun Akiyama & Takeshi Rikio. - Toryumon Mexico Dragon Mania III (May 11, '08) = Sasaki & Road Warrior Animal won the vacated UWA Tag-Team Titles, beating Damian 666 & Damian el Terrible. - NOAH Budokan Hall (July 18, '08) = Sasaki pinned KENTA. - NOAH Budokan Hall (September 6, '08) = Sasaki won the NOAH GHC Heavyweight Title, beating Takeshi Morishima. - RoH The Tokyo Summit (September 14, '08) = Sasaki defeated Roderick Strong. - RoH Glory By Honor VII (September 20, '08) = Sasaki took down Claudio Castagnoli. - NOAH The Tournament '08 (December) = Sasaki beat Tsuyoshi Kikuchi, Jun Izumida, and Go Shiozaki, before falling to the eventual winner, Akitoshi Saito. - RoH All-Star Extravaganza IV (December 26, '08) = Sasaki & Katsuhiko Nakajima defeated Brent Albright & Roderick Strong. - RoH Final Battle '08 (December 27) = Sasaki & Katsuhiko Nakajima were beaten by the Briscoes.